The petition you are trying to access has expired, because it failed to meet the signature threshold. While you can’t sign this petition, there may be other petitions on We the People on a similar issue that you’d like to add your name to. Or, you can create your own petition. 11891 12-6-11 - only 3 days left, and we need 13109 signatures. Doing our best to get this petition out there. Not sure how this will really effect anything, but Toby started it, and I will help to spread it around a bit. Its going to require much more than a simple online petition to do much. No one really cares about a bunch of old cars. Then when they do care, you just end up with Prius lovers bashing the old "turbocharged, gas eating, dangerous, blah, blah" whatever they can come up with. It has a goal of 25k signatures. It has 117 with my name on it now. Head over sign up, sign in, and put a name on it. The laws can be changed, and this is one step, but in order to do it, a lot more would have to be done. Anything is possible, it just all requires effort from more than just a few people. I figured it felt like the right time to throw a bit of effort behind it. I know a lot of people, that know a lot of people, that know a lot of people. 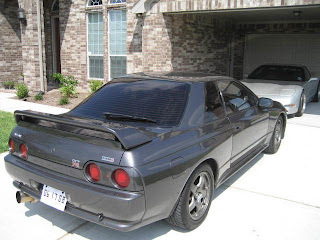 This is the reason the Nissan Skyline is illegal in the US. Car enthusiasts need to be a little more vocal. Don't let the few loud, over power us quiet many. We get pushed around doing what we enjoy doing. The "green" movement seems like it might be strong, but we need to be stronger. The petition made it to Autoblog. Thank you guys. Edmunds Inside Line posted it up on their blog. Thanks. Jalopnik also posted up an article. Thanks Mike Spinelli. Z-Car Blog posted up a request. Thanks Rob. Japanese Nostalgic Car blog put it up. Thanks to Wrecked Magazine for posting the petition link. Occupy the Truth About Cars. Some more information on imported vehicle seizures. Got my sig for sure. Facebook, here I come to spread the word. Car enthusiasts should not be deprived of this freedom and expression in cars. I vote too. Not sure how I feel about the whole compromise deal. This baby-steps approach could backfire. There was no law against importation, then there was. Repeal the law. Every car I've owned has been a domestic. Chevrolets, Pontiacs... But this goes way beyond that. Anyone who is a car enthusiast of any type should sign on to this. I'll spread this as much as I can. No one can tell me that a 15 year old Japanese car is more or less safe then the rusted out Civics or Cavaliers that litter the USA. I want to start a new one, it eneded and I want these cars! how can we start a new one? email me at jordanhammond92@aol.com if anyone w3ants to start a new one.